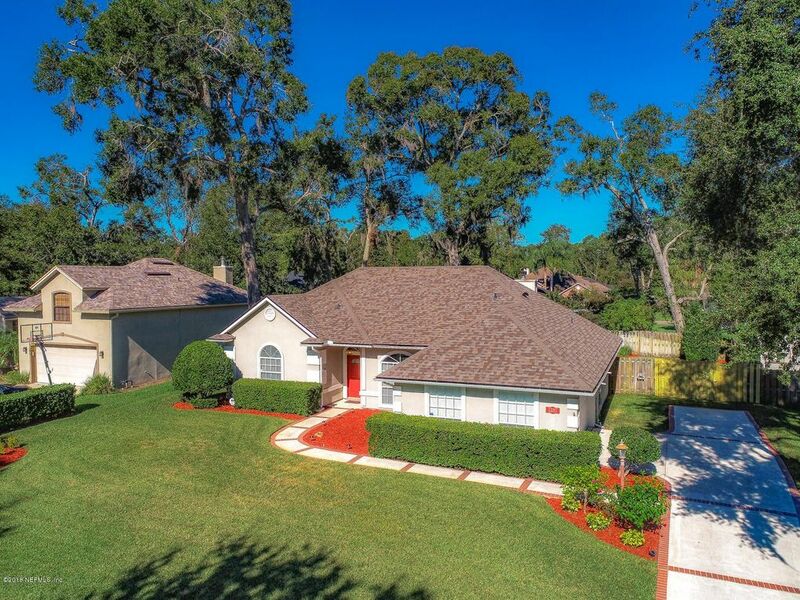 Move in ready gorgeous home situated on nice fenced yard in sought after Gately Oaks community! Away from the hustle & bustle yet close by to shopping, retail, dining, NS Mayport, 295, JIA, Beaches & St Johns Town Center! Step into tiled foyer which leads to formal dining area & separate living room which overlooks back yard! Fully equipped kitchen w/dbl oven stove, French door fridge, built in micro & dishwasher as well as granite counters, 42'' cabinets & bar top that open to nook & large family room which has gleaming wood floors & gas fireplace; French doors lead out to screened lanai. Master retreat has plenty room for oversized furniture; his & hers closets w/ double sinks, sep garden tub & shower. Roof-2017, h20 softener-2018, also 1 yr warranty 2-10 $540, see supplement. Textured knock down ceilings throughout, crown molding, wainscoting, hand scraped wood floors, irrigation meter for sprinkler system & side entry garage. There is a street light to get in and out of the neighborhood. Community has lots of mature trees & landscaping; some of the homes are on the water and sell for much higher. The seller has maintained the home meticulously. Fireplace is propane gas, this seller and previous have not had tank hooked up - if buyer chooses to get inspected, Buyer to incur cost. MBR, LR, FR and Front Right Bedroom Curtains do not convey. Directions: From Atlantic Blvd, head north on Kernan Blvd to end. T/R on McCormick Rd , T/R at light on Gately Rd, T/L on E Gately Oaks Lane, T/R on Sun Marsh Dr , house on left.